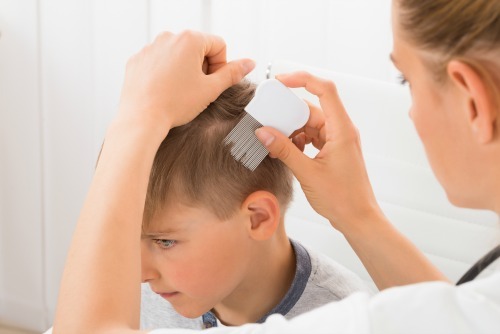 Head lice is not a topic anyone really wants to talk about, but if your child gets it then it is something that has to be addressed. I have been a school nurse for well over 15 years and I have seen a LOT of lice over the years. Being an expert at head lice is not anything I really wanted to become, LOL, but nevertheless I am pretty knowledgable about the topic!! I know some really good tips to keep your kids from getting head lice this school year. Parents who are proactive are going to have kids that are a lot less likely to get a call from the school nurse! The most important tip to keep your kids from getting head lice is no sharing. I know that telling your kids to not share goes against everything we want our children to become….kind and giving people. Sharing is probably the BIGGEST way kids pass lice around. Teach your children from the time they have hair to never share combs, brushes, hats, crowns, etc. Even in daycare settings head lice is an issue. Kids in daycare may share dress up clothes, winter hats and even play hats. To help keep your kids from sharing you can keep a comb or brush in their backpack so they have one handy and won't have a need to borrow. Remind them that even sharing headbands, hair bows, scrunchies, etc could pass lice around. These days earphones and ear buds are commonly shared and these items are also a NO-NO! I had a friend in elementary school with the longest, prettiest hair I had ever seen. I NEVER saw her wear it down to school. It was always braided, in a pony tail, etc. Her mom knew that having that beautiful hair down was just asking for trouble. If you are the parent of a girl with longer hair I would advice you to keep it up at school. Kids put their heads close together and this is an easy way for lice to crawl from one head to another. If the hair is up it will reduce the changes of getting infested. The start of school usually means the start of slumber parties and sleepovers. My guess is that more kids contract lice during sleepovers then they actually do in the school building. When your child goes to a sleepover always send their own pillow and sleeping bag or blanket. Tell your child the importance of actually using their own pillow and blanket. If you are hosting a slumber party ask the guests to please bring their own pillow and sleeping bags as well. Remind the guests to not share clothing either. I have talked with a LOT of parents who swear by certain shampoos as a way to deter lice. Lice apparently don't care for certain scents. There are some quality shampoos on the market that are made to deter lice. If you have your child use these shampoos regularly it may help prevent them from getting lice. One brand that I like is the Fairy Tales brand. Some of the scents that are supposed to repel lice are tea tree oil, menthol, eucalyptus oil, lavender oil, rosemary oil, lemongrass, and citronella. One of the biggest problems I encounter with parents is a total lack of understanding about lice in general. The CDC has a very informative page that is all about head lice. One big thing to remember is that lice do not fly or hop. They are a parasitic insect that crawls. Human lice are not transmitted by animals….only humans. Head lice do not spread disease. One important way to keep your kids from getting head lice is to know your school's head lice policy. I would assume that every school in the USA has a policy on head lice. Some schools follow their state guidelines or they may have their own local guidelines. Many, many schools and states are changing the guidelines in response to the American Academy of Pediatrics recommendations. The AAP recommends that students NOT be excluded from school due to live lice or nits (eggs) in the hair. This is something MANY parents do not realize. Most parents I talk to think that kids who have lice are sent home from school until they are completely free of lice and eggs. That is not how it works most places now. Most schools allow students to remain in school with lice. Your child will be in school with kids who have active lice probably every single day this school year. The only real option left to parents is to do what they can to teach their children about prevention. Follow these tips to keep your child from getting head lice this school year and hope for the best! Remember……if your child does get head lice it isn't the end of the world! It can happen to ANYONE! Check out my post on the BEST way to get rid of head lice! Has anyone at your house ever had lice? What is your favorite tip for keeping your kids from getting head lice?